This week's arts and culture column is on a book that is deeply dear to my heart. D.J. Waldie, born in 1948, was raised in the Los Angeles suburb of Lakewood, a planned suburb of 17,000 homes incorporated in 1954 and the first of its kind in the West. He still lives in the same 957-square-foot house his parents bought in 1946. For decades, he worked at Lakewood City Hall, most recently as deputy city manager. Waldie does not drive and has said that he ordered his writing around the reflections that came to him during his 25-minute walk to and from work each day. On one level, “Holy Land” is history, geography and sociology. We learn of the three Jewish developers who envisioned and built Lakewood, the 30-man construction crews, the concrete-mixing trucks that waited in a mile-long line to erect as many as 500 homes a week, the eucalyptus and red crape myrtles planted at precise intervals along the identical streets and the post-World War II home-buying frenzy. 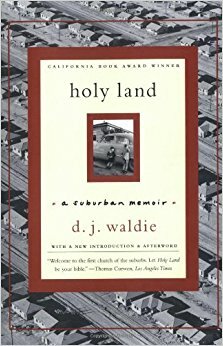 On another level, “Holy Land” is a memoir “of a place more than an account of a life,” Waldie has said. "GOD'S HOTEL" BY VICTORIA SWEET, M.D.